Hayball Sydney’s GL(E)AM Forums have been growing from strength to strength since launching in June this year, demonstrating a thirst within the industry for a GL[E]AM-centred gathering for thought leadership. You may be familiar with the GLAM acronym which refers to the cultural sector of Galleries, Libraries, Archives, and Museums. Hayball has added the fundamental ‘E’, by proposing that education (or learning) is core to the design of cultural projects – a concept that bridges our unique lens of culture, community, and learning within the built environment. We began the forum initiative as a conversation and knowledge-sharing exercise, as well a means of professional development for our own team. By reaching out to our network of design professionals, academics and researchers who are all breaking new and exciting ground within this area, we’ve been able to share this knowledge and encourage cross-pollination of ideas, from the fundamental to the radical and everything in-between. The forums have proven highly successful and been embraced by the industry as a welcome addition to this growing and uniquely specialised area. 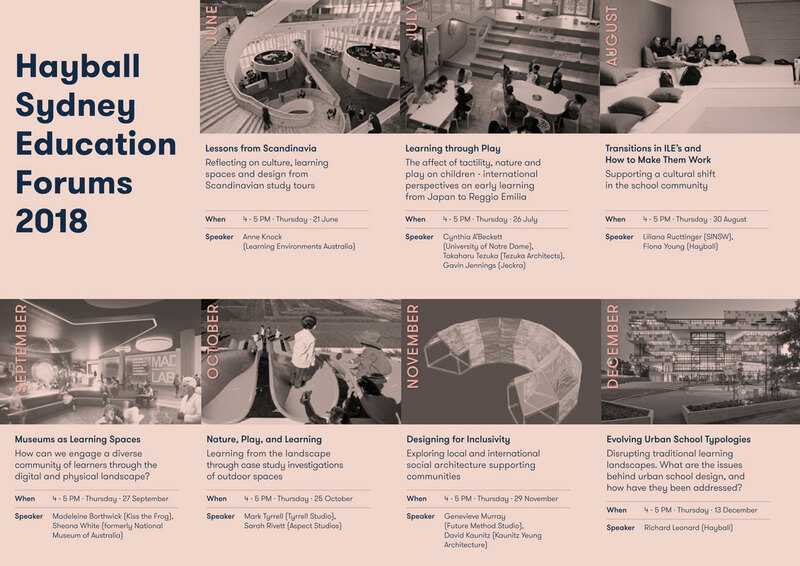 Themes and topics have been framed through the expertise of our extensive network within learning and cultural sectors, and we have built a robust calendar of events covering topics ranging from the myths and facts of Finnish schools to refreshing perspectives on museums as learning spaces. We’ve embraced the fulfilling task of connecting people to ideas, places and perspectives they wouldn’t have otherwise considered. A memorable example from an early Forum saw a gathering of three speakers of very different backgrounds to discuss ‘Learning through Play’. Cynthia A’Beckett (University of Notre Dame), Takaharu Tezuka (Tezuka Architects), and Gavin Jennings (Jeckra) spoke from perspectives of early learning academic, architect and developer, with the session proving particularly dramatic having to coordinate with the Japan Rail timetable to connect Takaharu live from a train station via Facetime! This forum showcased the central premise of the initiative – to nourish and enrich the practice and thinking of both attendees and participants. These forums have taken off and grown through encouragement and need within the industry into a pillar of our practice. As leaders in the ever-evolving realm bridging culture and learning, we feel a responsibility and delight in being able to help drive the conversation by leveraging our knowledge-base, research capabilities and global industry contacts to further knowledge in this area. From the early days of Hayball staff and small outside audiences, the forums are growing at an accelerated rate, gaining the interest of a diverse audience beyond our immediate team to include leaders and teachers from educational organisations, representatives from cultural institutions and government, design collaborators, as well as university academics and students. We are excited to continue presenting the unlimited possibilities that are unfolding around themes of culture, community and learning, and sharing this thinking with everyone who has an interest in GL[E]AM! 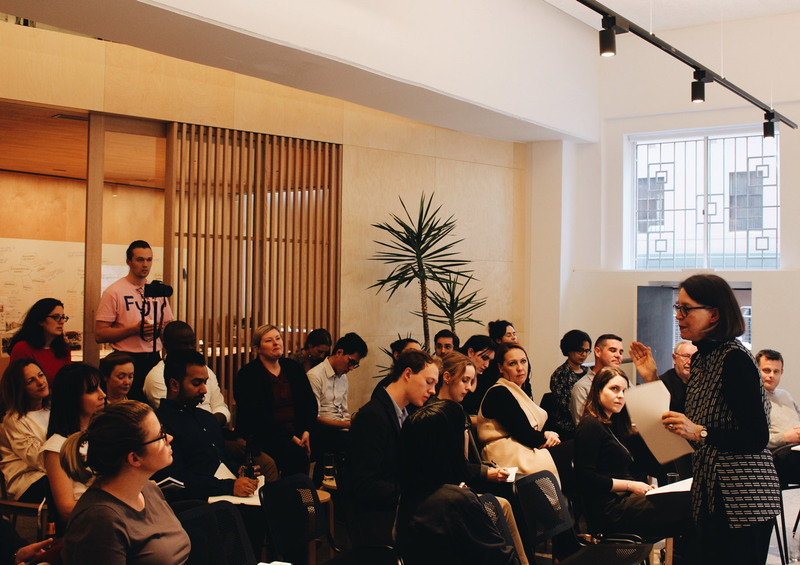 Hayball’s final GLEAM forum of the year focused on inclusive methodologies around designing for indigenous communities. Genevieve Murray from Future Method spoke passionately about the community and arts-based projects she’s involved with through her business partner Joel Spring who is an aboriginal architect from the Wiradjuri community. She emphasised the importance of process and time required in developing relationships as part of community projects. David Kaunitz spoke about the work his practice, Kaunitz Yeung were involved with both within Australia and abroad, working collaboratively with communities and using this process to empower them through post-disaster re-building and in the final product of buildings that provide for community beyond merely functional requirements. The discussion turned to cultural diversity and the unfortunate lack of indigenous representation in the architecture profession and what we as architects can do to encourage change. Kaunitz Yeung have initiated an aboriginal architect internship program which seeks to both support indigenous students to get through their degrees, and then employ them as graduates, a wonderful initiative that many participants were keen to learn more about. Stay tuned to this page for the upcoming 2019 timetable of events.